Here are some of the best abs exercises that you can do on the floor with an exercise ball. If you've read the page on the exercise ball, then you understand that a ball can enhance your ab workouts. Some abdominal exercises on the ball, such as crunches and Russian Twists focus on the abs from a seated position on the ball. And other ab exercises on the stability ball, such as roll-ins and piques focus on the abs by placing the feet on the ball. The 3 abs exercises below focus on the abdominal muscles while you're lying on the floor with the exercise ball between your feet and your knees. This is a great exercise to increase the focus on the ab muscles and take some pressure off the lower back. By squeezing the ball you engage your hamstrings slightly, and this de-activates the hip flexors. The hip flexors are the muscles that attach to the lower back and bend your hips. When the hip flexors are more active than they should be, more pressure is placed on the lower back. Here's how you perform the exercise. Starting Position: Begin by lying on your back. Then, squeeze the ball against your thighs with your feet. Form: Use your abs and lift the ball off the floor. Curl your pelvis and bring your knees towards your chest. Hold briefly at the top and slowly lower the ball back towards the floor. Personal Trainer Tips: Use a ball size that is appropriate for your height. When you're standing the ball should be just about level with your knees. This exercise requires flexibility in the lower back, so stretch your lower back if you feel limited. I know the stomach can get in the way sometimes, so just do your best or try regular reverse crunches without the ball. Form: Lift the ball about 2-3 inches off the floor. Then, slowly roll your legs to one side. Go as far as you can control without lifting your shoulders off the floor. Then reverse directions. Personal Trainer Tips: This is a great exercise to aid flexibility in the lower back, and it strengthens the abs, lower back muscles and obliques. You get the same benefit as in the above exercise. Squeezing the ball de-activates the hip flexors and allows the abs to work more efficiently while also taking pressure off the joints of the lower back. This is another one of my favorite ab exercises to show clients. It will really challenge the core muscles in ways most people never feel. At first glance it may look easy, but what makes this exercise challenging is that you have to fight against yourself. Starting Position: Begin by lying on your back, and place the exercise ball between your feet. When you reach up for the ball, your hands should be 5-6 inches away from the ball. If your hands are close to the ball, adjust the position by moving the ball further away. Form Easy Version: Crunch up and attempt to touch the ball with your finger tips. Hold briefly at the top, and slowly lower to the floor. Form Harder Version: Crunch up and touch ball with your finger tips. Then, attempt to push the ball out of your feet. Squeeze with your legs, so that the ball does not move. You provide your own resistance. Hold the squeeze at the top for 1 second and slowly lower to the floor. Personal Trainer Tips: This exercise may take a little time to master. This is a great core exercise because it stabilizes the hips, pelvis, lower back, and shoulders. Your inner thigh (adductors), abs, and shoulders (lats/ latissimus dorsi) all work in this exercise. The trick is to squeeze the legs, abs, and arms all at the same time during the up phase of the exercise. You can perform 2-3 sets of each of these exercises to get a good ab workout, or you can add some of these exercises to your normal routine. Aim for 10-20 repetitions per exercise and do them in a circuit fashion. Begin with the first exercise, and without resting do the second and then the third exercise. Rest 30-90 seconds after the third exercise and then repeat the sequence 1-2 more times. And you're done. 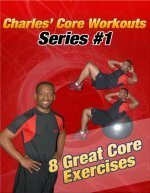 I hope you find these exercises fun and challenging. To learn additional exercises check out the Directory of Abdominal Exercises. Work your Abs and Core Muscles 2-3 times a week, and keep visiting this site to learn as much as you can.